Saturn’s moon Titan is a world of contrast; both eerily familiar and strikingly alien. Its calm seas and enormous sand dunes might remind you of Earth, until you learn that what’s flowing across Titan’s surface is not water, but liquid hydrocarbons. Titan’s nitrogen-rich atmosphere seems to have some of the ingredients for biology, but any life forms evolved to thrive at temperatures of -290 degrees Fahrenheit would be practically unrecognizable. A new scientific paper supports the idea that life might exist on Titan, but that it would be nothing like life as we know it. After studying spectroscopic data collected by the Atacama Large Millimeter/sub millimeter Array (ALMA) in northern Chile, researchers are now reporting that Titan’s atmosphere is rife with vinyl cyanide, a molecule that could, in theory, form “cell-like” membranes under the moon’s unique environmental conditions. In fact, based on the levels of vinyl cyanide present in Titan’s atmosphere, its seas could—in theory, we’re not saying there are aliens—be bubbling with tiny cell membranes, with concentrations similar to those of bacteria in Earth’s oceans. The membranes that enclose the cells of all living things here on Earth are made of phospholipids, molecules with long, non-polar (water-repelling) “tails” and polar (water-loving) heads. If you remember high school biology, you’ll know that phospholipids form a bi-layer, with the water-loving parts on the outside, and the water-repelling bits on the inside. This structure allows membranes to bubble off tiny pockets of water from their surroundings, creating cells that house genetic material and support biochemical reactions. That’s all well and good for organisms evolved to thrive in the temperate, liquid water seas here on Earth, but the membranes our biology uses simply wouldn’t work in the cryogenic methane seas of Titan. (They’d be far too rigid, and water-loving/water-repelling bits would have to be reversed.) So, what could cells on Titan look like? Two years back, researchers at Cornell University used chemical models to attempt to answer that very question. Through those models, they produced a functional cell membrane that remained stable and flexible at incredibly low temperatures, using none other than C2H3CN, or vinyl cyanide. Maureen Palmer, a recent graduate of St. Olaf College and lead author on the new study, explained. “It would be sort of the same but sort of the opposite of how cell membrane lipids work on Earth,” with the polar bits on the inside, and the non-polar bits on the outside. It was a fascinating hypothesis, but there was one problem—nobody had ever confirmed that vinyl cyanide is actually present on Titan. (NASA’s Cassini spacecraft found tentative evidence for the molecule several years back.) Palmer and her colleagues decided to fill in this gap, by examining calibration data ALMA collects at Titan before turning its telescopes to stare at other targets. Sure enough, they found compelling evidence that large amounts of vinyl cyanide are present in Titan’s atmosphere—mainly, at altitudes greater than 200 kilometers. The research was published today in Scientific Reports. In fact, in Ligeia Mare, a methane sea larger than Michigan’s Lake Superior located near Titan’s north pole, Palmer and her colleagues estimate there could be as many as 30 million azotosomes per cubic centimeter of “sea water.” For comparison, costal ocean waters on Earth have about a million bacteria per cubic centimeter, according to one paper’s estimate. “This is a crucial point and lab experiments ought to be done,” Lunine added. Palmer agreed. “I’m hoping someone will do a study of trying to form the membranes in the lab, seeing if they’re actually able to form,” she said. Her co-authors are currently trying to better constrain the abundance and distribution of vinyl cyanide in Titan’s atmosphere—this first paper was just a rough look. They’re also searching for evidence of other biologically-relevant molecules on Titan. 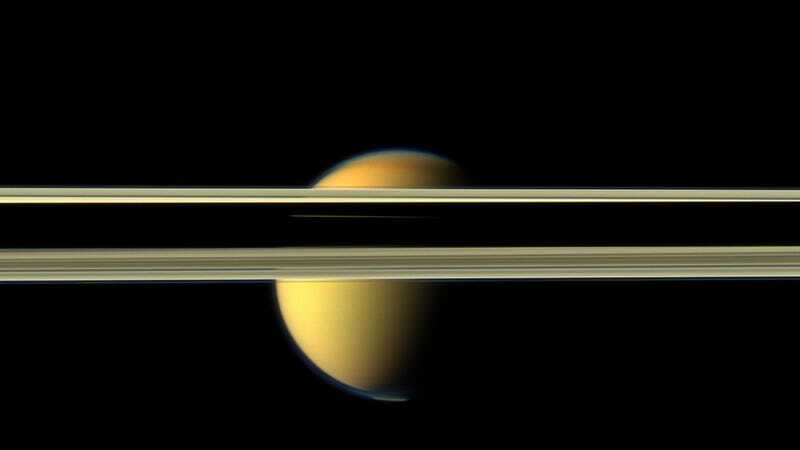 Also this week, another team of scientists reported the detection of ‘carbon chain anions’—potential building blocks of complex biomolecules—in Titan’s upper atmosphere, using data from Cassini. Ultimately, resolving the question of whether or not Titan is home to some seriously weird life forms will require a future mission that can land on its surface—maybe a cryogenic methane-proof submarine. Palmer is definitely rooting for a lander. Let's go alien hunting on Titan, please!